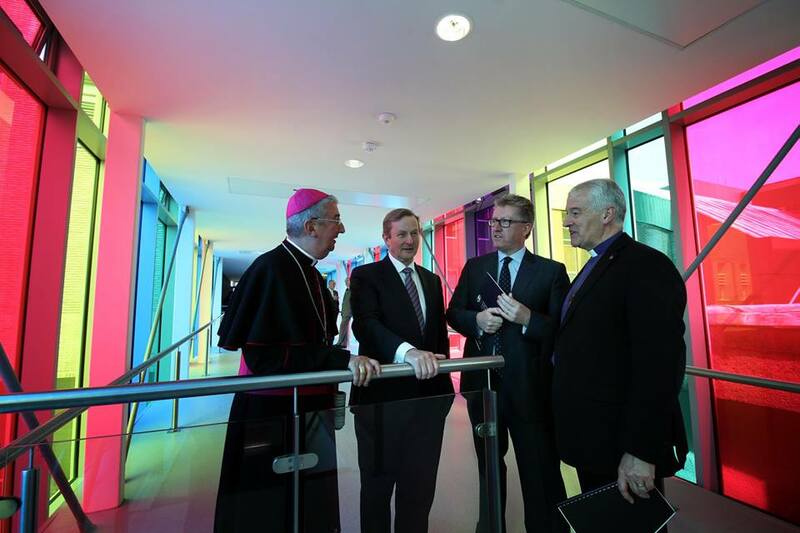 Archbishop Diarmuid Martin, Taoiseach Enda Kenny, President Daire Keogh and Archbishop Michael Jackson at the official opening of St Patrick#s College Drumcondra’s new campus development. Pic courtesy: St Patrick’s College. 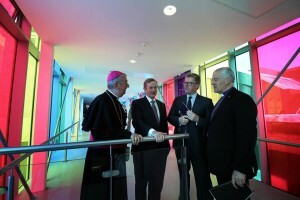 Archbishop Diarmuid Martin joined the Taoiseach Enda Kenny, Archbishop Michael Jackson of the Church of Ireland, and Dr Daire Keogh for the blessing and official opening of a new campus at St Patrick’s College Drumcondra in Dublin on Thursday. In his address after the blessing, the Archbishop noted that the bonds between St Patrick’s and Dublin City University were solidifying as a new institution of excellence in education was about to get underway. From September next, St Pat’s will come under Dublin City University as students from Mater Dei Institute of Education and the Church of Ireland College of Education relocate to the Drumcondra campus. This “incorporation” plan is part of a reduction strategy in the number of teacher training colleges across the country from 19 to six. In his address on Thursday, Archbishop Martin suggested the changes underway at St Pat’s should be considered “one of the most exciting and far-seeing educational projects in the Ireland of our time”. He added that he was happy that this new enterprise would embrace “a vital space for religious education, in both the Catholic and the Church of Ireland traditions, as a model of the renewed place of religious education in a pluralist Ireland”. “Some people fear change; change unnerves them. The ethos of this college is one where change has driven excellence and there has never been fear of being innovative and creative – except perhaps the fear of government funds not being forthcoming,” he said. Dr Martin explained that for him ethos was not some vague idea, but a concrete approach to teaching which focuses on the good of children but also sees the teacher becoming a focal point in many aspects of community life and in a broad understanding of what education means. “When you look at photos of the early days of St Patrick’s you can see just how much the college has changed over the years. The college has changed in order to focus more effectively on its role and on the service it wishes to bring to Irish education,” he said. Founded in 1875 to train teachers for Catholic primary schools, St Pat’s currently has 2,600 students, which is due to rise to 4,000.